A lady was telling the other day that she saw a man driving down the interstate, and a dog was hanging on to the tail gate for dear life. She said if he hadn\’t been going so fast in the other direction she would have tried to stop him. 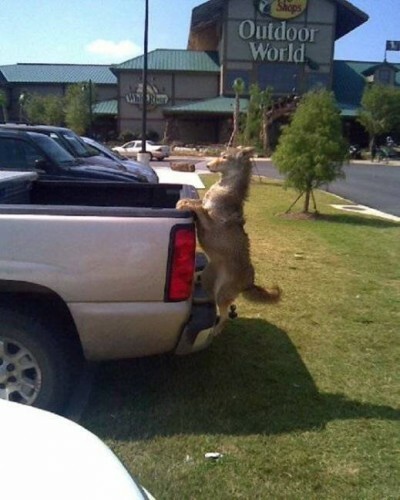 A few weeks later her son sees this truck at the Bass Pro Shop! He’s found the perfect way to curb tailgating! No one will get too close for fear of dog crap on the windshield. This is the best thing never! Instead of trying to change the word. Would give me a reason to throw dog poo out the window. Or a well hidden catapult in the truck bed methinks. Oh, c’mon, this is funny. Not only is it a fantastic form of advertisement but it makes fun of all the stupid shits who leave their dogs in the back of the truck without tying them in.